An SR22 is a form that is required when the state Department of Motor Vehicles (DMV) places a suspension on your license due to some action that you have taken, such as driving without insurance. Upon your request your insurance company will issue an SR22 filing at the time that you purchase, at least, the minimum amount of liability insurance required by the state. Should your insurance lapse after your company has issued your SR22, your insurance company will notify the state, in keeping with their legal obligations. At that time, your license will be suspended, and you will be required to pay a reinstatement fee to have your driving privileges restored. Briefly, SR22 filings are the states’ way of insuring that you keep minimum levels of insurance in force. How do I get an SR22? You get an SR22 when you both sign an application for insurance, as required by the state, and make the initial premium payment to a company who offers SR22 filings. Not every company offers SR22 filings and not every agent is authorized to file them immediately for you. However, agents at Hartley Insurance, Inc., as well as some other local agents are authorized to do so. How much does the SR22 cost? Nothing, usually. Most insurance companies will issue SR22s as a free service when you purchase minimum liability insurance as required by the state. You are required to pay only the actual cost of the insurance that you purchase. How long must I maintain an SR22 filing? The length of time that SR22s must be maintained varies depending on individual circumstances. The Department of Motor Vehicles can, however, give you more detailed information relating to your own SR22 filing. Who will notify me when I no longer need an SR22? No one, probably, because no one is specifically responsible for notifying you, your agent, or your insurance company. Do keep track of the date when you will no longer need an SR22, though, since you may qualify for lower rates at that time. The practice of using credit history as a factor in insurance underwriting is becoming more common. Despite the statistical connection between an individual’s credit history and his or her likelihood of filing an insurance claim, some state legislators and regulators are proposing measures to restrict or ban insurers from using this information. history: Although the use of credit information is new for some insurers, the practice has been permitted since 1970 when the U.S. Congress passed the Fair Credit Reporting Act (FCRA). The use of credit information provides insurers another tool to use in making fair and objective underwriting decisions. Independent studies have proven a strong connection between credit history and the likelihood of an individual filing a claim. A Tillinghast-Towers Perrin study demonstrated that there was a 99 percent probability of a relationship between a person’s credit rating and likelihood of that person having a claim. Studies by Arthur Andersen and the Insurance Research Council show that credit reports are more reliable than motor vehicle records. In addition, consumers have a clearly defined review process to ensure the accuracy of their credit report. In January 2000, the Virginia Bureau of Insurance released a study that concluded that credit scoring is an accurate predictor to assess insurance risks and that the use of credit information does not discriminate based on income, race or other demographics. Rationale: Consumers benefit from the use of credit information because most people have good credit. Insurers have found that using credit information can help them write more policies and allow consumers to pay less. Companies have reported that they are able to accept some customers that would have been denied coverage using more traditional underwriting criteria. In addition, many consumers qualify for lower insurance rates because they have good credit. One NAII member found that using credit histories enables it to charge 70 percent of its customers lower premiums. Most companies use credit information as just one of several factors in the underwriting decision. It provides insurers with an objective tool for decision-making that evaluates risk and allocates the cost of coverage based on a consumer’s claim potential. Insurers do not use credit information to determine a person’s ability to pay premiums. Insurance companies use a credit score to assess an individual’s credit risk at a particular point in time. The score looks at specific credit information and assigns a weighted numeric value. It reflects credit payment patterns and looks at items such as collections, bankruptcies, outstanding debt, length of credit history, types of credit in use and the number of new applications for credit. Credit information helps insurers make more accurate underwriting decisions, applicants and policyholders who are financially stable can enjoy lower premiums, while those who are less stable pay a premium that better reflects the risk they represent. The ability of insurers to make sound underwriting decisions also helps keep the insurance marketplace competitive. Why do insurance companies want to know about all licensed drivers living with me? Many insurance companies want to know about all licensed drivers living with you for the following reasons. Your own auto insurance coverage usually extends to others who you authorize to use your car. Those licensed drivers living with you are more likely to borrow your car than are others. Therefore, the insurance company may base their willingness to insure you as well as the premium that they charge you on both your driving record as well as the records of those living with you. This allows companies to charge you a premium that is in keeping with the risks that they are assuming in agreeing to insure you. On the other hand, some companies may rate your insurance as if no other drivers were living with you as long as such drivers have insurance of their own. Finally, some companies may require you to sign an “exclusion,” which permits the insurance company to deny coverage should “excluded” individuals cause accidents in vehicles that you insure. Even if a company allows you to sign such an exclusion, it may be unwise to do so since doing so places you in a position to assume potentially significant financial risks. The names and addresses of all drivers and passengers involved in the accident. Names and badge numbers of police officers or other emergency personnel. 8. If you run into an unattended vehicle or object, try to find the owner. If you can’t, leave a note containing your name, address and phone number. Record the details of the accident. Call your insurance agent as soon as possible, regardless of who is at fault. Find out whether you’re covered for this loss. Even if the accident appears minor, it is important that you let your insurance company know about the incident. Ask your agent or company representative how to proceed and what forms or documents are needed to support your claim. Your insurance company will require a “proof of claim” form and, if there is one, a copy of the police report. Increasingly, companies allow you to monitor the progress of your claim on their web site. Supply the information your insurer requests. Fill out the claim form carefully. Keep good records. Get the names and phone numbers of everyone you speak with and copies of any bills related to the accident. If I need to submit additional information, is there a time limit? 5. Remember, each state has its own laws governing the claims process. If you have any questions, call your agent, company representative or your state insurance department. 1. Let your agent or company representative know that you are unhappy. If this individual is unable to solve your problem, get the name and phone number of the head of the insurer’s claims department. Your insurance company may also have a consumer complaint department that may be helpful. 2. Be prepared to support your case. 3. Review your auto insurance policy. 4. Contact your state insurance department. 5. Call the National Insurance Consumer Helpline. If after hearing from your insurance company’s claims executive you still feel your claim hasn’t been handled properly, call 800-942-4242. It is a toll-free consumer information telephone service sponsored by the insurance industry. Trained personnel and licensed agents are available to assist consumers who have complaints. The Helpline operates Monday – Friday, 8:00 a.m. – 8:00 p.m. ET. 6. Contact an arbitrator to hear your case. This should be your last resort. However, if you do feel the need for legal assistance, consult an attorney who specializes in auto insurance. Each stateís bar association offers a free legal referral service, which will give you names of qualified candidates. Attorneys work either on an hourly rate or on a contingency basis, depending on the type of case. Get the attorney’s fee structure in writing. You can remain current on the progress of your claim by insisting that you receive copies from your attorney of all correspondence. Your attorney must have your agreement before committing to any settlement. You may be reluctant to file a claim because you fear that your premium will go up or your insurance will be cancelled. Practices vary from company to company. In general, an insurer will increase your premium by specific percentages for each chargeable claim made against your policy above a specific dollar amount. A chargeable claim is one the insurer considers primarily your fault. The percentages and ceilings vary from company to company. These increases generally stay on your premium for three years following the claim. If you have an accident but donët report it to your insurer, you are taking a risk, even if the damage seems minor. If the other driver sues you weeks or months later, your failure to report the accident might cause your insurer to refuse to honor the policy. And even if they do honor the policy, the delay will certainly make it harder for the insurer to gather evidence to represent you. There are several standard guidelines for determining the value of your car for insurance purposes. You and your insurer can refer to the Blue Book, which lists the depreciated value of all new and used cars. One Blue Book is published by the National Association of Automobile Dealers (NADA) at http://www.nada.com. The other is published by Kelley Blue Book of Irvine California at http://www.kbb.com. When you file your claim, your insurance company will refer you to a claims adjuster. 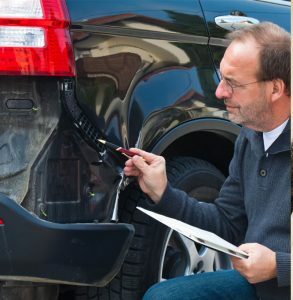 The adjuster will verify the loss and determine what it will cost to repair the car. The adjusterís estimate can serve as a benchmark to compare your own mechanicís estimate. No good adjuster or insurance company will expect you to sign an agreement accepting the insurerís estimate as the total claim payment until youíve established, to your satisfaction, that it will cover the cost of repair. The insurer will expect you to get your own estimate from your mechanic, garage or car dealer. Donít allow yourself to feel pressured into accepting the insurerís estimate of repair costs without getting at least one estimate of your own. Your insurance company can’t require you to have repairs done at a particular shop. But they can insist that you get more than one estimate for the work to be done on your car. Just as you want to make sure that your car is adequately repaired, the insurer wants to make sure it doesn’t pay a grossly inflated repair bill. Don’t be surprised if your insurance company opts to pay for the lowest bid. You donít have to accept that bid if you believe the low bid wonít adequately repair your car. Don’t hesitate to argue with the adjuster if you really believe his repair estimate is too low based on what your mechanic has told you. One factor that could reduce the amount of your claim for a repair job is what insurance companies call betterment. If your old car is repaired with brand-new parts, your insurer may argue that the repairs have actually enhanced the carís value and therefore they can legitimately reduce your claim by the difference between a used part and a new one. It’s up to your insurer to decide whether to pay for repairing your car or to declare it a total loss and pay you its book value. Most standard auto policies will not pay to repair a vehicle if the repairs cost more than the cash value assigned to the car. There won’t be any dispute about whether to repair the car if it was completely totaled. But you may argue about what the pieces of the car were worth when they were assembled as a car. For you to get a settlement higher than the Blue Book value of your car’s make and model, you will have to submit evidence such as mileage records, service history and affidavits from mechanics to show that your car was worth more. Youíre entitled to the market price of the car you just lost. You shouldnít get more or less than what you are due. If you have any questions regarding your rights under the policy, talk to your insurance agent or company representative. You may also contact your state insurance department, state attorney general’s office, or your state’s consumer affairs department. The parts most frequently damaged in auto accidents are “crash parts”. These are the sheet metal pieces that cover the engine and frame of the car. These may be parts known as original equipment manufacturer (OEM) parts, or generic parts. These crash parts do not affect the safety of the car. The development of a market in generic parts has brought prices for car replacement parts down and saved consumers money.